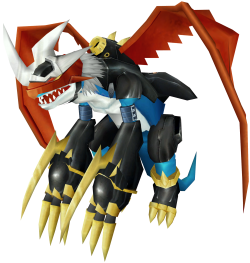 Imperialdramon (Dragon Mode) is an Ancient Dragon Digimon whose name and design are derived from "Imperial Dramon Dragon Mode".An ultimate Ancient Dragon Digimon that existed in ancient times. There is a clear distinction between it and other Digimon in terms of existence or ability. Also, Imperialdramon is called the Dragon Mode, but there seems to exist a "Fighter Mode" that is able to liberate all of its power. However, it is said that that form has never been seen. Due to its immense power, controlling it is next to impossible, and depending on how it is raised it may become a savior or a god of destruction. Shoots a powerful laser at opponents. Shoots a fireball that annihilates everything.